A pretty set perfect for your dresser or to give as a gift. 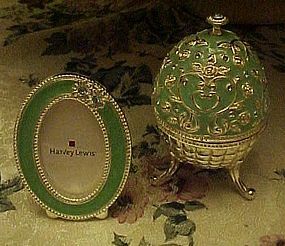 BRAND NEW NEVER USED condition.Silver tone egg with turquoise enamel accents and matching turquoise velvet interior in the egg. Egg measures 3 1/2" tall and sits on three curvy little legs. matching oval photo frame is 2 7/8" tall and will fit a 1 1/4" x 2" photo. Easel on the back. Both pieces are embellished with aqua rhinestones. 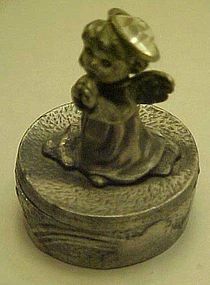 Sweet little trinket box is made of solid pewter and has a praying angel on the top. Inside her halo is a large clear rhinestone which is meant to represent the Diamond birthstone for April. Measures 2 3/8" tall. 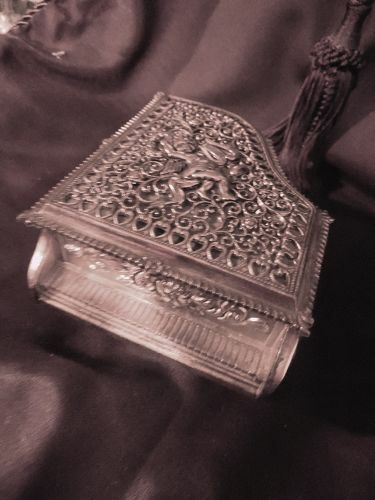 Perfect condition,and perfect for a ring or small item. 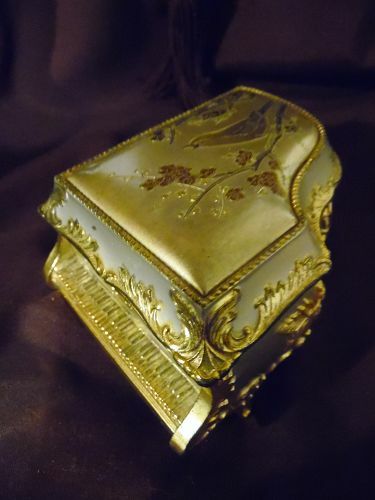 A very pretty vintage jelelry box for your vanity. 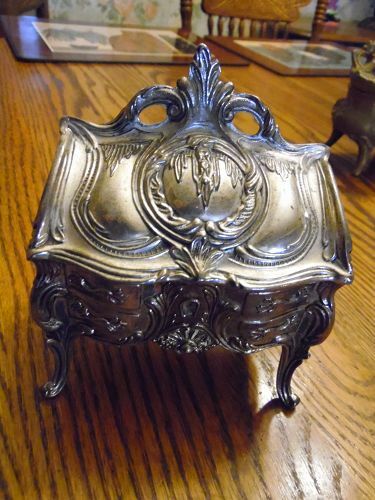 Made of silver tone metal and has elaborate florals and scroll designs. 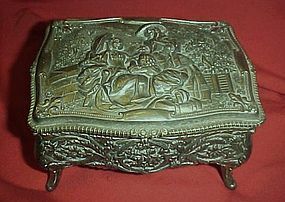 On the lid is a relief scene of ladies and a little girl in a garden. Stands on 4 legs and stands 3" tall. Rectangular shape is approx 4" x 5". Red velvet lined. 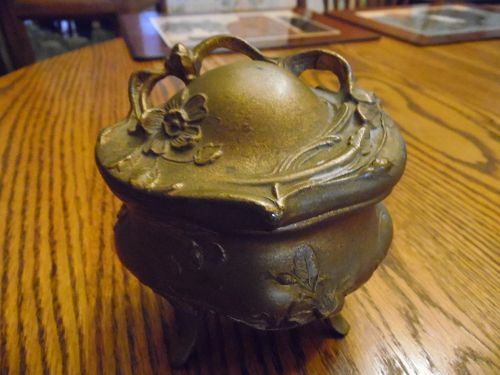 This is a very old stamped metal box and is from England. Lots of fancy petals and flowers. Oval shape measures 7 3/4" x 9 1/4". It is 2 1/2" deep. Average condition, with wear, and has been loved and used. Nice old patina. A few dings on the bottom and paint wear. 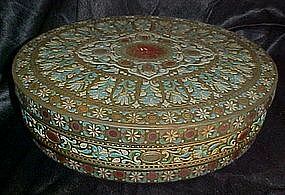 Would make a great sewing box. 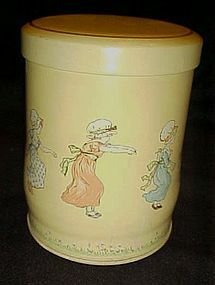 A great tin for your collection, or just to use. 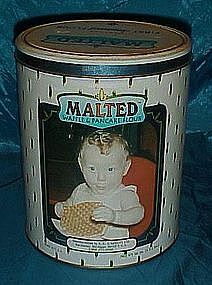 Carbon's malted waffle & pancake flourtin, has a nostalgic little baby holding his breakfast waffle. recipes for pancakes & waffles on the back of the tin. 60 oz. can measures 7 1/2" tall. Very nice condition with no dings or rust. 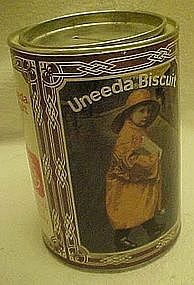 This is a great tin for the collector or just to add that special presentation to a special homemade gift. 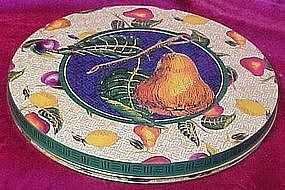 Covered tin is just 1" thick and has a diameter of 10"/ Covered with a great fruit patern featuring a large pear, with plums, lemons. Nice condition. No dents, rust or scratches. Would be nice to hold candied fruits or specialties. 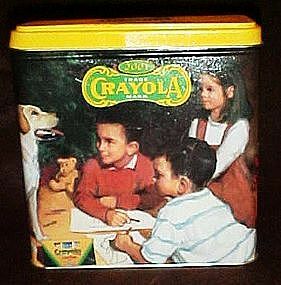 Dated 2001 this crayola tin was issued by hallmark and has a coin slot in the top to use as a bank later. The back features the original 1951 Crayola advertisement which highlights their quqlity since 1903. great condition. 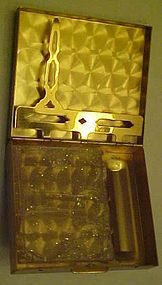 A minor ding on the edge of the lid which can be pused out. 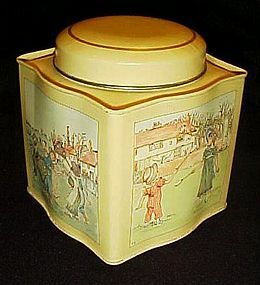 colorful and delightful collectors tin. 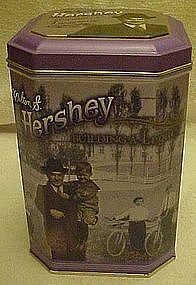 #3 tin from Building a Legacy series features Milton S. hershey who was a legacy as a town leader and inspiration to all. 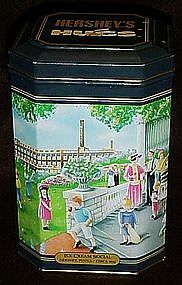 He established the Hershey Industrial School for orphan boys, among many other important accomplishments for the town of Hershey PA. Tin is 6 1/4" tall and is in excellent condition with no damages. 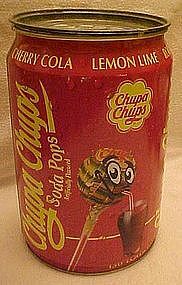 Large sadvertising store display tin held 150 assorted lillipops. Graphic are all excellent. Slight rust on the top lid. No dents, scratches or discoloration.